It's hard to believe that the Gloves Off Gala is only 2.5 months away! The menu has been decided and our mouths are already watering! Just A Taste Catering is surely going to knock it out of the park once again. 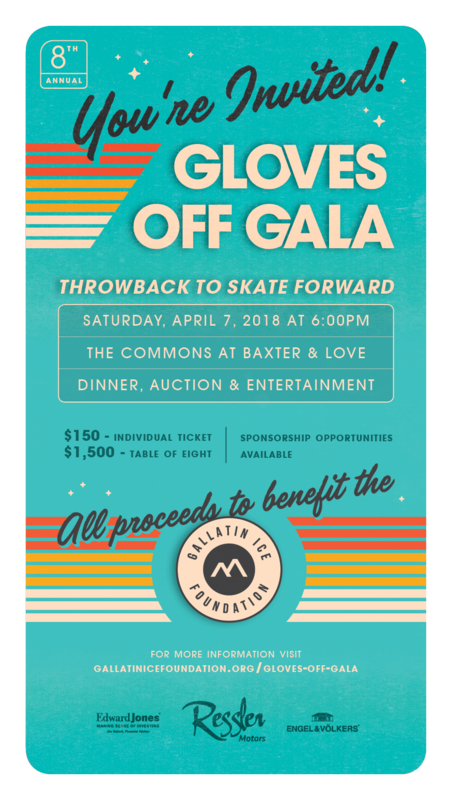 We hope you can join us for an evening celebrating and supporting the Gallatin Ice Foundation and the 'Raise the Ice Barn' campaign. And as our small team finalizes details, volunteers will continue reaching out to our community for auction donations. The ability to offer one-of-a-kind auction donations inspires generous bidding and results in more resources for the GIF, so if you are interested in donating an item or want to join our auction squad, please let us know. Finally, we are pleased to announce that Christiana Dudik will be serving as our intern for the Spring semester. Christiana is already a familiar face on the ice, coaching figure skaters and hockey players alike, and will be a welcomed addition in the office. The Construction Committee has been meeting with local contractors and a mechanical engineer to optimize the insulation and mechanical packages for Phase III. The team reported that they are getting lots of questions answered, and are encouraged by the progress made and everyone's enthusiasm for finding efficient and cost effective solutions for our next critical construction step. They expect to have more firm budget numbers in the next few weeks! For many in our community, Haynes Pavilion and the Ice Barn have become a second home. Youth and adults alike, from all walks of life, are enjoying the benefits of figure skating, hockey, curling and more. Perhaps most importantly, they are building relationships and skills that are bigger than the activity they participate in. Things like learning to get up when they fall, how to effectively communicate with teammates and coaches, respect and understanding for decisions by referees and judges, and that they are part of a community where everyone is valued and welcome. The experiences and skills that ice users earn will benefit their personal and professional relationships, enhance their physical and mental health, and will give them experience as a committed and contributing community member. We at the Gallatin Ice Foundation are not only proud to be leading fundraising efforts to expand the Ice Barn, but that we are part of the collective effort that is providing more opportunities for members of our community to learn, grow and play with one another. We feel incredible gratitude for our ice family and the home our two rinks have created. Please consider making a year-end donation to the Gallatin Ice Foundation. Your gift will make a lifelong impact on members of our community for generations to come. On Jan. 12 we opened the doors to Ressler Motors Ice Rink at the Ice Barn adjacent to Haynes Pavilion, right in the heart of Bozeman. In addition to doubling refrigerated ice capacity, the Ice Barn has created more opportunities for participation and program development for ice enthusiasts of all ages and interests. The convenience of having two rinks side-by-side has also provided more opportunities for the ice community to connect with one another. Curlers, figure skaters, and hockey players are learning more about each other. Youth are being mentored by more coaches, experienced athletes, and specialists. And families are expanding as they interact and share experiences with other parents, grandparents, and siblings. So... Are two rinks better than one? Ask the public who have 35% more public skating opportunities. Ask the figure skaters who have more than 35% more ice time. Ask the curlers who now have reliable and reserved ice time, curling houses, a home bonspiel competition, and have doubled their membership. Ask the youth hockey players who have new home tournaments and added 60 minutes of ice time each week. Ask the women, over 40 year olds and never-ever hockey players who now have leagues of their own. Ask our neighboring restaurants, shops, and hotels who are welcoming more people through their doors to eat, shop and sleep. We are so grateful for everyone who has contributed to make the second rink possible; we couldn't do this without you. And for those who have the capacity, we ask for continued support as we enter our next phase to insulate the Ice Barn. Insulation will give us the opportunity to further expand our ice season and improve both the user and spectator experience. Consider a year-end gift to the Gallatin Ice Foundation to support the expansion of the Ice Barn - an incredible public asset that serves our community today, and will do so well into the future. Give today to support insulating the Ice Barn, because two rinks are better than one. Bozeman and its surrounding communities in southwest Montana are defined in part by long, cold winters and the enthusiastic embrace of an active lifestyle. This past January, the Gallatin Ice Foundation opened the doors to the Ice Barn - a facility that exemplifies the cold and active spirit of our communities. For its inaugural 3-month season, the Ice Barn welcomed hundreds of participants and supporters to enjoy a myriad of activities on Ressler Motors Ice Rink. From curling to sled hockey, to figure skating and hockey, our newest facility made an incredible impact on the lives of community members of all ages. With improvements made during the summer, we were able to add two months to the 2017-2018 season for a total of 5 ½ months of on-ice programming in the Ice Barn. Already we are hearing incredible feedback from those benefiting from new and extended opportunities, and we are welcoming lots of new faces to our ice family. Because of that feedback we are more determined than ever to further extend the capacity of Ressler Motors Ice Rink. Insulating the Ice Barn will allow our community to immediately benefit from programming on Ressler Motors Ice Rink for an extended period of time, spanning all four seasons of the year. Hosting specialized clinics and camps bringing in outside competition and coaches. Youth participants will be able to practice and train on ice year-round, making them more competitive with those in other regions of the US and Canada. New leagues during every season - so you don't have to decide between football and hockey, or skiing and curling. Additionally, and perhaps most importantly, participants will benefit year-round from the valuable support and relationships they have with teammates, coaches, and fans. Further extending the Ice Barn season will sustain and expand the health benefits, community relationships, and local economic development that ice-based recreation currently brings to our winter months. Give today to support insulating the Ice Barn, because community shouldn't be seasonal.